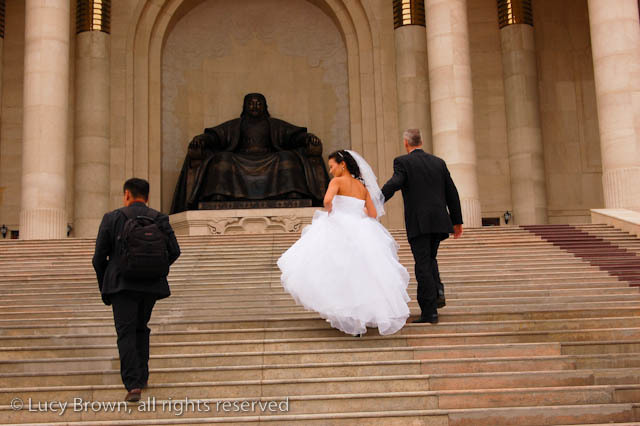 One of the stops on our wedding party city tour was the Sukhbaatar Square named after Damdin Sukhbaatar who led the Mongolians to independence from the Chinese in the 1921 revolution. 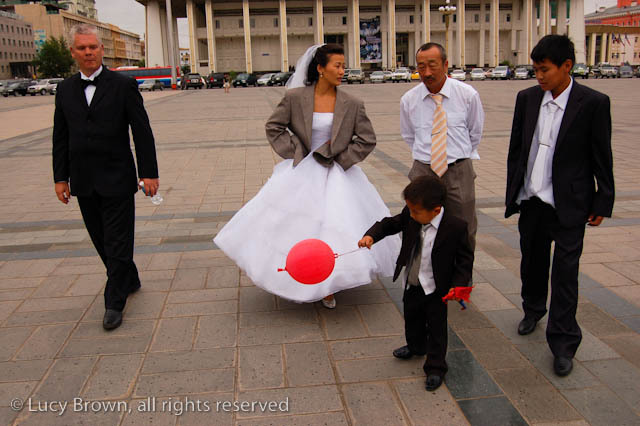 Walking across Sukhbaatar Square. My older brother Matt is on the left. 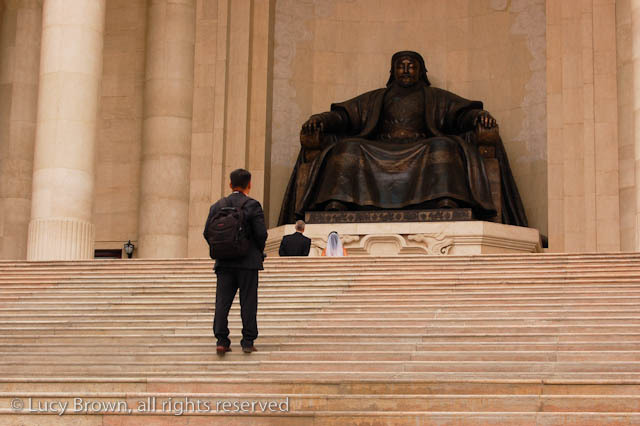 Here Mike and Anna came face to face with the immense bronze statue of Chinggis Khaan (pronounced Chinggis Han in Mongolia and known as Genghis Khaan in the West) commanding a view of the square from the top of the steps of Government House. Chinggis Khan united many of the nomadic tribes of northeast Asia, founded the Mongol Empire and conquered most of Eurasia in the 1100 and 1200s. 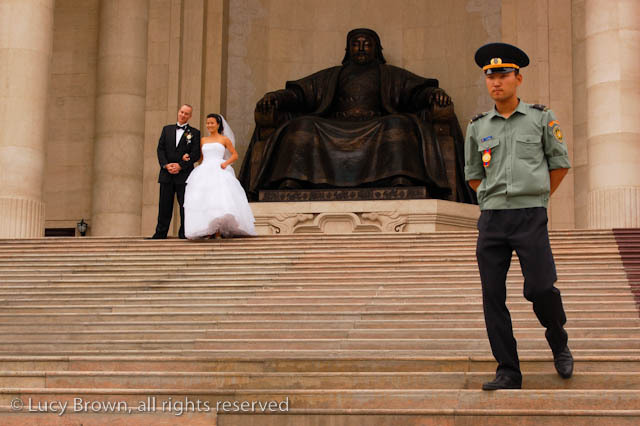 Nowadays this Mongol warlord is a source of great national pride. They have written songs about him, named hotels, restaurants and the international airport after him and his image appears everywhere from money to vodka and beer bottles. 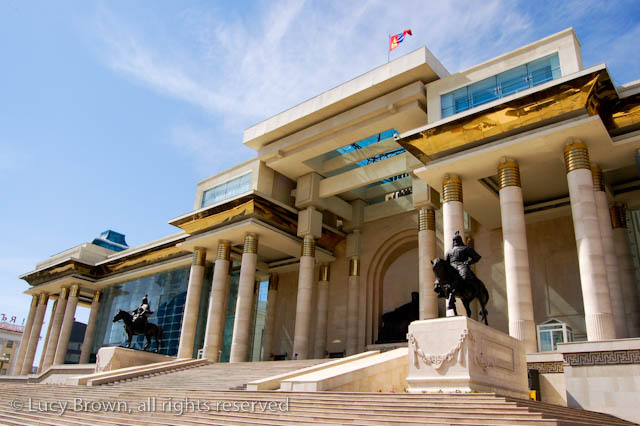 Going to meet Chinggis Khaan. 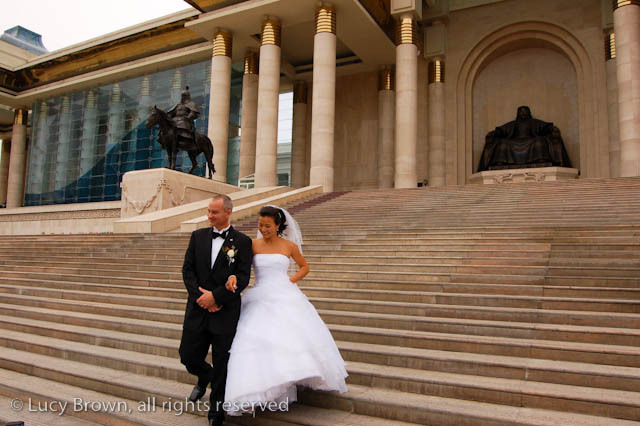 They rope off the area in front of Government house and only Mike, Anna and the photographer climbed the steps. The security guard stopped the photographer. 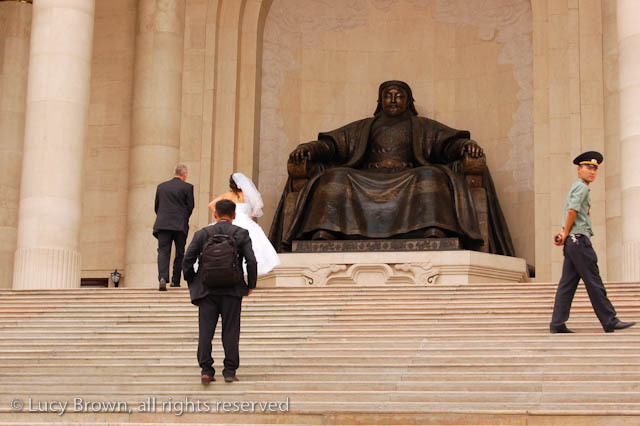 This statue of Chinggis Khaan is so important that they only allow newly weds on their wedding day to mount the stairs and approach it. 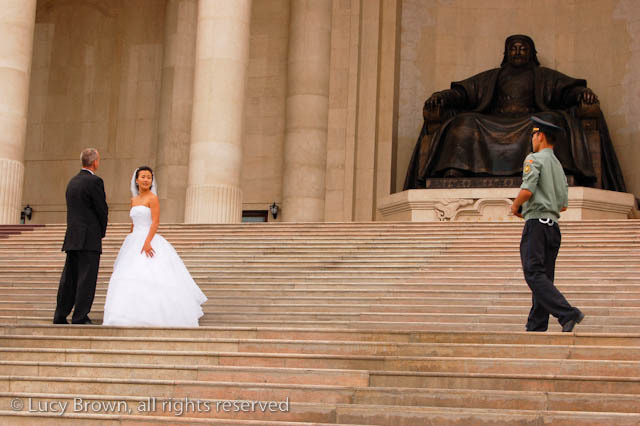 The photographer waits while Mike and Anna stand in front of the statue showing the scale of it. Everyone is happy but especially Mike. 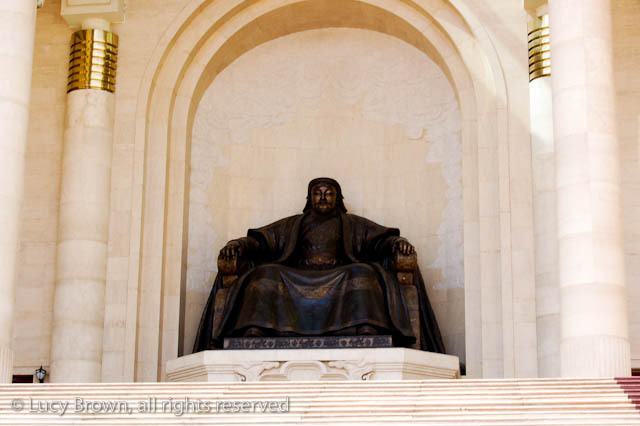 He has a strong interest in Chinggis Khaan and made a documentary about the search for this great leader’s tomb. The descent to the waiting wedding guests. 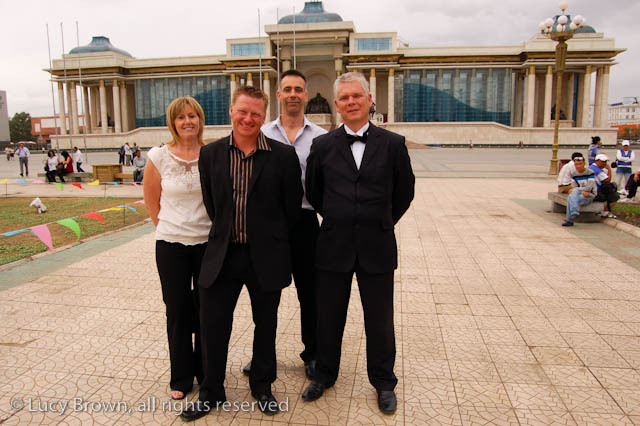 English friends Kerry, Mark and Andy and my older brother Matt with Chinggis Khaan peering out between their heads.